Art is Functional. It lifts your spirits every day. The Hillsborough Gallery of Arts, an artist-owned and operated gallery in downtown Hillsborough, NC, presents the seventh annual featured show, It’s All About the Story. Each year gallery members choose a local author and book or story collection to respond to in their own medium. Previous authors include Michael Malone, Jill McCorkle, Lee Smith, Allan Gurganus, John Bemis, and Nancy Peacock. 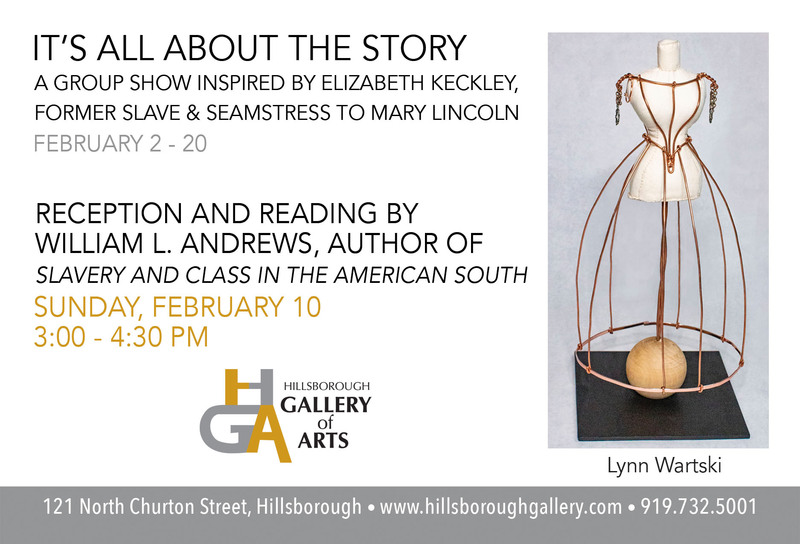 This year the artists have selected a work by a person who plays a very significant role in the history of Hillsborough, Elizabeth Keckley. Her memoir, Behind the Scenes, or Thirty Years a Slave and Four Years in the White House, describes her remarkable journey from slavery in Hillsborough to freedom as an accomplished dressmaker and confidante of Mary Todd Lincoln. Each piece in the group show, It’s All About the Story, is inspired by Keckley’s inspiring book. The show runs from February 1st–February 20th. To receive Hillsborough Gallery of Arts Newsletter please complete the form below with your name and email address. 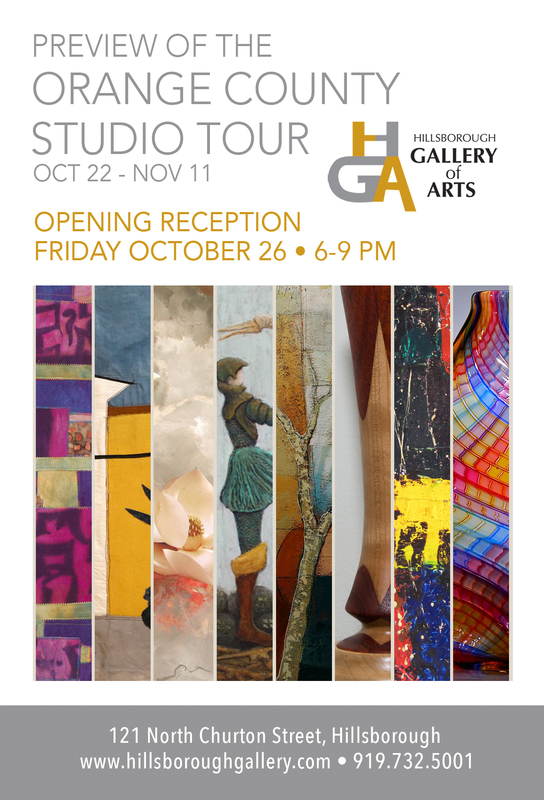 Hillsborough Gallery members Linda Carmel, Ali Givens, Marcy Lansman, Eduardo Lapetina, Alice Levinson, Ellie Reinhold, Mike Salemi, Jason Smith, and Pringle Teetor are included in a preview show for the Orange County Studio Tour. 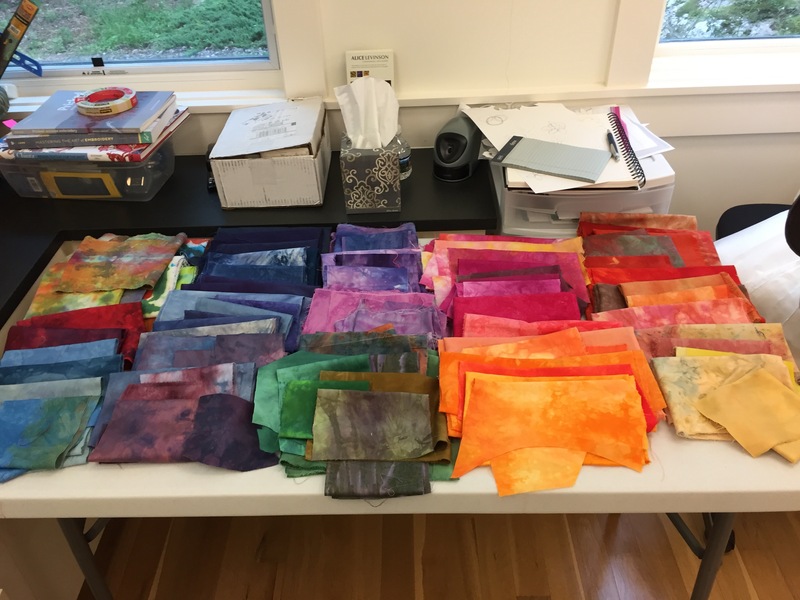 HILLSBOROUGH, N.C. – Oct. 16, 2018 – PRLog — This marks the 24th year that the Orange County Artists Guild will host its Annual Open Studio Tour. During the first two weekends in November, more than eighty artists located throughout Orange County, including Chapel Hill, Carrboro, Hillsborough, and surrounding areas will be participating in this juried event and opening their studios to visitors who will discover where the creative design happens! For the eighth year, Pringle Teetor and Linda Carmel will be showing together at Carmel’s home studio, 101 Huntington Drive, Chapel Hill, #53 on the tour. Pringle’s blown glass and Linda’s textured paintings complement each other perfectly. There will be plenty to see and touch. Ali Givens returns to the studio tour for her second year. 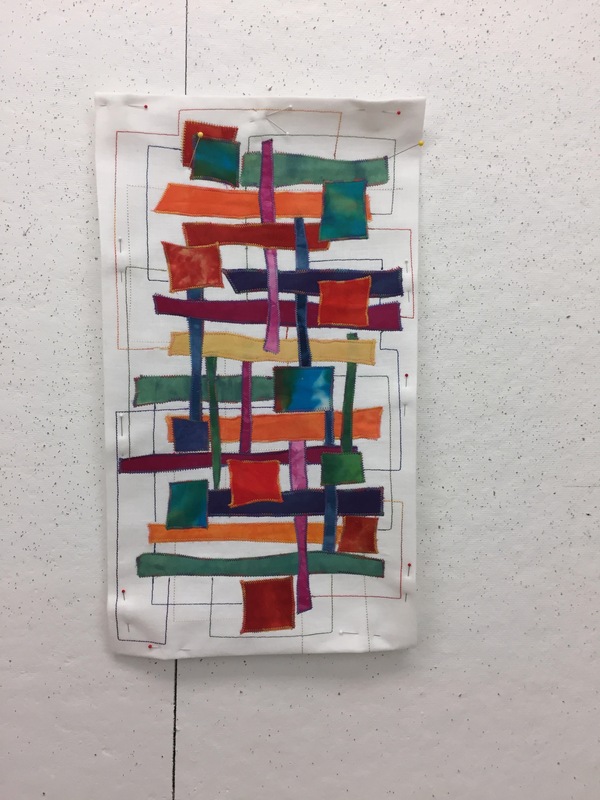 Ali creates fabric collages that are landscapes, cityscapes and still lifes sewn from hand-painted cotton, colorful batiks and other natural fibers. Her studio is #12 on the tour located at 3611 Mijos Lane, Chapel Hill. Marcy Lansman returns to the tour for her 13th year. She will be showing at the studio of Nancy Smith at 201 Morningside Drive in Carrboro. The number is #35. Marcy paints with acrylics and her work has evolved from realistic to more abstract, expressive of personal insights and emotions. Ellie Reinhold is joining the tour for the sixth year. She is #60 on the tour and will welcome you at her studio off Roosevelt Drive in Chapel Hill, in the neighborhood across from Cafe Driade. Reinhold explores vibrant landscapes using color, brushwork, and iconic imagery. Michael Salemi is a woodturner who is showing jointly with Miriam Sagasti at her studio (#21) at 1604 Meadow Ln., Chapel Hill. Michael’s work includes both traditional woodturning forms: bowls, plates and platters, and unusual pieces such as ikebanas. Alice Levinson will be exhibiting her contemporary wall-hung textile pieces. Each is rich in color and texture, and composed of hand-dyed fabric, densely sewn. Her studio is #16 on the map, 3604 Pasture Road, Hillsborough. Jason Smith creates one of a kind metal sculptures in steel and copper using reclaimed material. His sculpture is abstract. The manipulation of form in space allows the viewer to feel rhythm and movement in his compositions. Jason’s studio is #3 on the map, 1709 NC HWY 86N, Hillsborough. 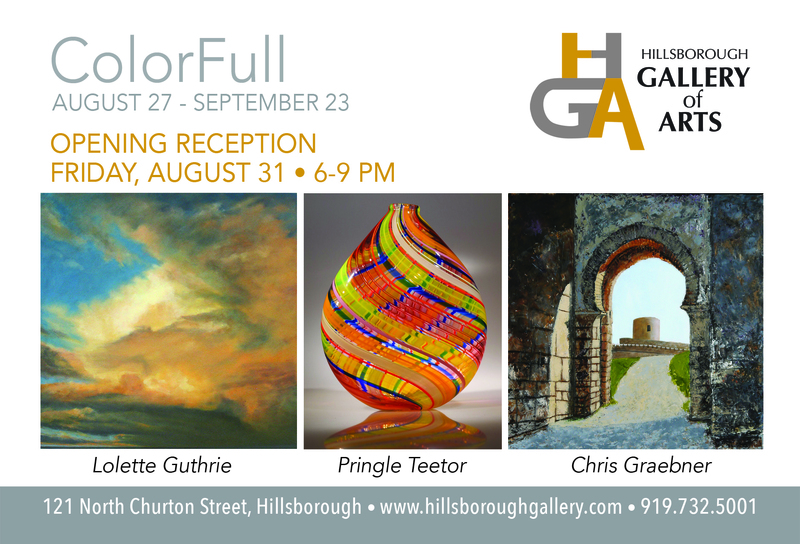 Many artists on this year’s tour will have work in the OCAG Preview Exhibit at the Hillsborough Gallery of Arts. Their work will be on display from October 22 through November 11, 2018. This preview show is a wonderful opportunity for a first look at the work on the tour and can help you plan your tour route. An opening reception for the exhibit will be held on Friday, October 26th from 6-9pm at the Hillsborough Gallery of Arts, located in the Mercantile Building at 121 North Churton Street in historic downtown Hillsborough, North Carolina. The Hillsborough Gallery of Arts is owned and operated by 22 local artists and represents these established artists exhibiting contemporary fine art and fine craft. The Gallery’s offerings include oil and acrylic paintings, pastels, sculpture, ceramics, photography, textiles, jewelry, glass, metals, encaustic, enamel, and wood. The gallery is open 10am-6pm Monday –Thursday, 10am-9pm Friday/Saturday and noon-4pm on Sunday. What does “mixed media” mean? The answer varies from piece to piece and artist to artist. 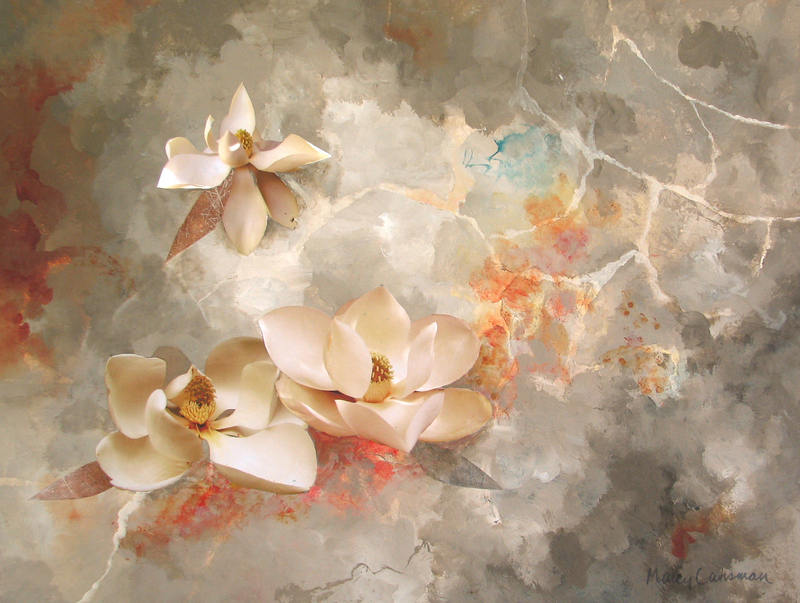 Here’s what it means in the case of my painting, “Dreaming of Magnolias,” shown below. 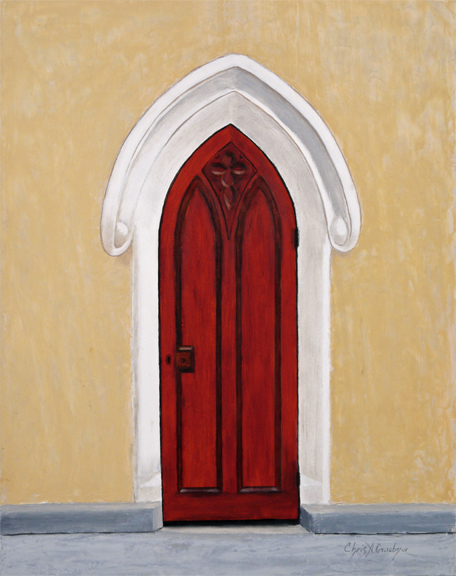 This piece is part of TRILOGY, the current featured artist show at the Hillsborough Gallery of Arts. Strange as it may seem, I started the piece by tearing brown paper grocery bags into random shapes and pasting them down on a white panel using acrylic “matte medium,” a fluid the consistency of thick cream that is often used as glue. The result was a brown mosaic with white “cracks,” somewhat reminiscent of a stone walk. (You can see what remains of the “cracks” in the upper right quadrant of the painting.) I have used this technique in many of my abstract paintings because I like the random linear elements it adds to the finished piece. I covered this mosaic with fluid acrylic paint in a random pattern of neutral gray-beige tones ranging from dark to light with touches of orange, rust, red and even a little blue. I liked the resulting painting but felt that it needed something. At the time I was taking a class in collage. The class gave me the idea of pasting photographs on top of the random gray-beige background. I used to have a huge magnolia tree in my front yard, and I have taken hundreds of photos of magnolias over the years. I blew some of them up, cut them out, and threw them down on the painting. To my surprise, I liked the effect. But I didn’t like the way the magnolias stood out against the background. I wanted them to blend in. So I used Photoshop to adjust the color of the shadows in the magnolias so that they matched the gray-beige tones in the painting. This involved a long process of trial and error. I ended up with piles of magnolia rejects, flowers photos that were too yellow or too blue or too pink. The tone needed to be just right to create the effect I wanted: the illusion that the flowers were floating on the stony background of the painting. Then out came the matte medium again, this time to paste the photos down, as seamlessly as possible. I was delighted with the result. A couple of coats of acrylic varnish and the painting was done. When I first started making art, I painted realistic flowers in watercolor. Many viewers, especially people who are familiar with my earlier work, were convinced that I painted the flowers in “Dreaming of Magnolias” and the other mixed media pieces in the show. I can’t help feeling a little guilty as I tell them that the flowers are actually photographs collaged onto a painted background. But not so guilty that I don’t plan to continue experimenting with this technique. Maybe I’ll move on to mushrooms next. In TRILOGY, as in each Featured Artist show, three artists come together, based upon the coincidence of calendars. We choose a title, and then each go our own way, working independently with our particular medium, responding to the theme literally, metaphorically, or ignoring it completely. Typically with no prior collaboration, we arrive at the Gallery on the date of installation and the magic begins. Month after month, a conversation becomes a melody in harmony as three visual ‘voices’ blend and an integrated exhibit is woven from disparate works that vary in material, size, and subject matter. In TRILOGY, the voices of three artists tell a story of creativity across three mediums. In creating my sewn textiles, I use three key components: cloth, thread, and needle. My textiles always find their start in the cloth. Starting with white cloth experiment freely with dye, pigments, and printing techniques to created cloth which is complex in texture and rich in visual interest. Over the past several years, I have set aside lengths of cloth I found to be too interesting to cut up and use in assemblage work. This Spring I found I was drawn to these cloths. Monochromatic, they are notable for their subtle shadings and tones. 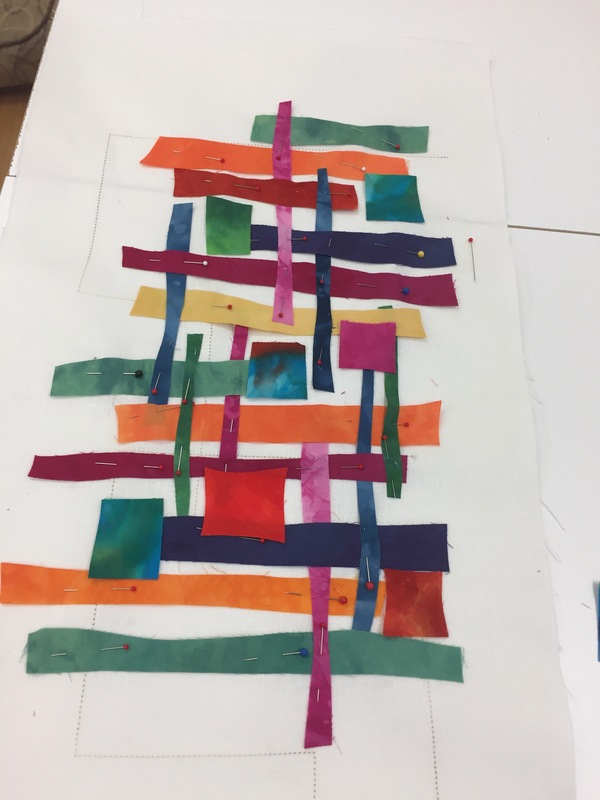 Working with whole lengths of dyed cloth, I’ve layered stitching with multi-hued threads to articulate visual motifs, and highlight the nuanced shading and tonality in the cloth. Cotton and silk threads of varying weights add texture, and depth to the work. Hand and machine embroidery, further enhance texture and add tactile and visual interest. The hand work is particularly satisfying. It proceeds slowly, a meditation of the rhythymic, repeated movement. Each line of stitching, each short length of thread has defines and pointed the way to what follows. The first series of three works feature a common motif of stitched lines of dancing tree-like figures, a frequent visual element in my work. 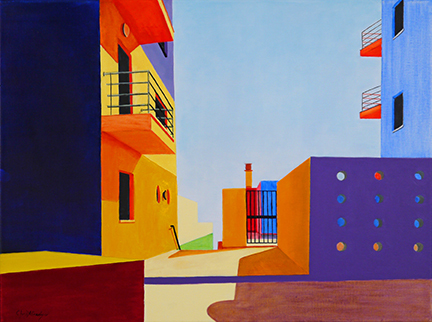 The third series is an effort to compose using color as a primary compositional element. They are bright and multi-colored. Spontaneity ruled their composition and underlies their playful, whimsical aspect. This proved a good balance to the meditative, labor intensity of the other works. I was having so much fun making them that I ended up with a whole slew of these pieces. All in all the work for TRILOGY has allowed an evolution to new ways of working which always invigorates and energizes my creative ‘engine.’ The accompanying photos give a hint to the work in progress and a look at my ‘palette’, in my case, a table full of colorful dyed cloth, the true inspiration for all of my work. After finishing college I spent 14 years running research labs, first in neuroscience and then in cardiology. It was a career that I loved, but when my son was born I returned to my first love, art. Art allowed me to work at home with more family-friendly hours. However, I think that much of my approach to painting has been influenced by my years in the lab. I love detail, and I love to find new ways to approach an old problem. When I see things I want to paint I’m constantly thinking about how I might do it. What technical problems are presented by that scene or that plant, and how should I handle those problems? What is the best medium – oil, cold wax, acrylic, ink, metalpoint, etc., then what is the best surface for it: canvas, linen, panel, paper, clayboard, scratchboard… Each image is a puzzle to be solved and assembled. Some artists paint from their memories or from their imaginations. I paint because I see something that moves me, something ephemeral, and I want to capture it and make it last. The places I paint are real places, the plants are real plants. Each is an individual experience. The process of painting internalizes that individual experience and makes it forever mine. And I’m at my happiest when the finished painting does the same thing for the viewer. I dearly miss those hot and sultry summers with five minute rainstorms in the afternoon that turn the streets into steaming ribbons of asphalt and bring rainbows all over the city. I especially love the bright colors of pastel madras clothing that, to me, are summers in New Orleans, where I was born. When I started working on cane pieces this winter, these memories were my biggest inspirations in my work. Patterns of lines in different colors are most easily produced by a complicated ancient Italian technique called cane work. Cane refers to rods of glass with color that can be simple, containing a single color on the inside (core cane) or complex with strands of one or several colors in pattern. Veil cane is where you have a color on the outside over a clear core, or at times a core of another color. Pulling cane takes a lot of time, especially if you want different types of cane in many different colors. My partner, Dana, and I spent a good bit of time this year pulling a lot of cane in many different colors. 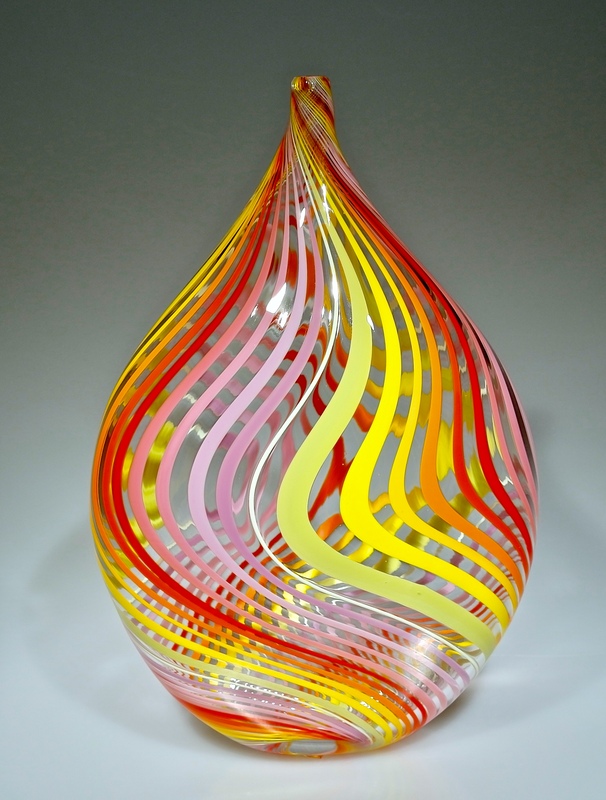 We would take a large a “gather” of colored or clear glass, heat it and shape it a number of times. For veil cane, we first make a “cup” of color, then stuffing it with a mass of clear glass. With a metal rod at each end, we would stretch the glass to a length of 30 to 50 feet. Once it is cooled, it is broken into pieces anywhere from 5 to 8 inches long. These pieces are carefully laid out on a kiln shelf and heated in the reheating furnace until fused, then rolled up on the end of a pipe. Finally we begin to blow glass! It is a long process but the outcome is amazing. With many colors and types of cane, the possibilities are endless, which you an see in the show Colorful! The majority of Pringle Teetor‘s pieces for this show are cane work, a centuries old Venetian technique of putting stripes of color and patterns into blown glass. “I’ve always had a broad color palette and here I am able to explore endless combinations of color patterns in clean lines.” The cane used in these pieces have either a colored core with clear on the outside, or veil cane, which has color on the outside with a clear core. Teetor made her veil cane with a variety of transparent or translucent colors, noting that as you look through the piece, the density of the color changes, causing interesting variations of color. Some pieces mix both types of cane, while others used strictly one or the other. In addition, several use varying size lines of contrasting colors to resemble plaids.